With degrees being so expensive, you're gonna want to make sure you're studying something that'll help you get a well paying job in future. Over the course of a lifetime, estimates suggest women in the UK can expect to earn about £250,000 more if they have a degree, while the figure is roughly £170,000 for men in the UK - so it definitely seems worth it. It's worth it more for some than others though. Perhaps unsurprisingly, there are big differences in the earnings of graduates from different universities. 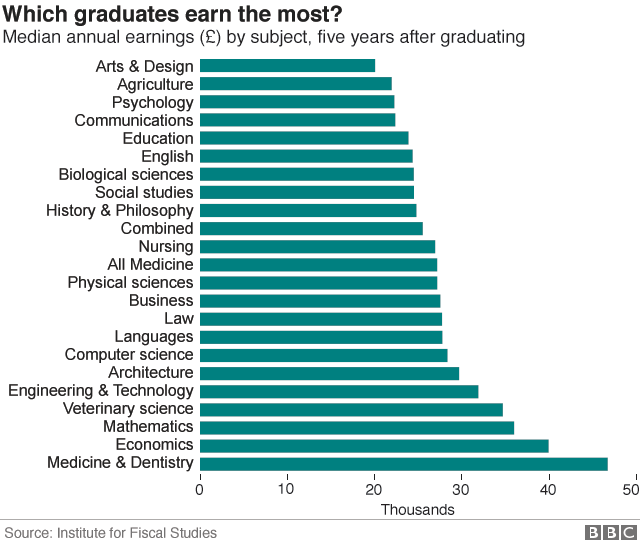 Five years after graduation, average annual earnings for students who were taught at the London School of Economics, Imperial College London and University of Oxford are more than £40,000. 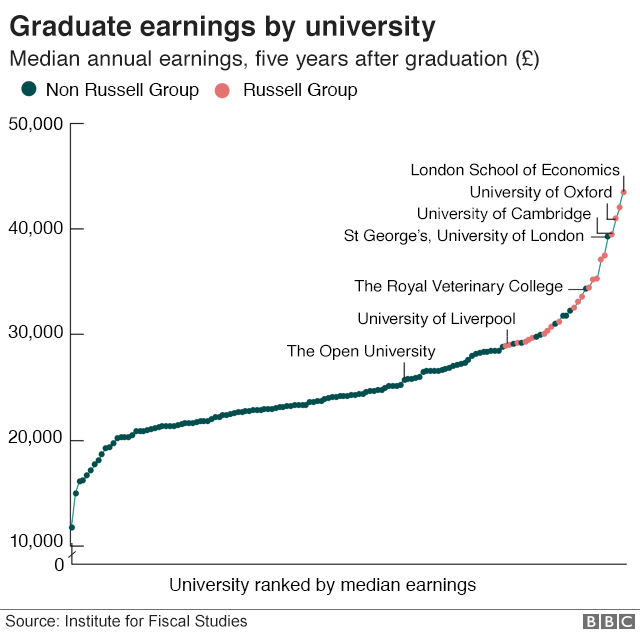 Graduates of the 24 Russell Group universities earn an average of £33,500 after five years - about 40% more than those who studied at other universities. At the other end of the scale, there are several institutions - many of them dance and drama colleges - where average earnings after five years are closer to £15,000. Importantly, many of the differences here are not down to the universities themselves. They have different average earnings partly because students aren't all the same - they have different abilities and interests. Entrants to Oxford, LSE and Russell Group universities start their degrees, on average, with better exam grades, for example. The big decision about what to study at university can be very important for future earnings. Five years after graduation, the income gap between students who studied the subjects that attract the highest and lowest salaries can be considerable. Graduates of medicine and dentistry earn an average of £46,700, while those who studied economics take home £40,000. These figures are about double the average wages of creative arts (£20,100), agriculture (£22,000) and mass communication (£22,300) graduates. Crucially, these differences are smaller, but remain significant, even when students with similar A-level grades are compared. As careers progress the gaps get bigger, with graduates of the high-earning subjects pulling even further away. For example, students of law, economics and management subjects at the London School of Economics do extremely well, with 10% of male graduates earning more than £300,000 by the time they are in their early 30s. The above information relates to graduates from UK universities, most of whom go on to work in the UK. While some Thai students will hope to find a job in the UK after they finish studying, many wish to return to Thailand or simply cannot meet the tough immigration requirements of the UK. The relative value of degrees is quite similar across countries, but you may find it informative to look at this table showing average pay rates for professions in Thailand.